Because of the “urgency of the situation”, the commission decided to – against all principles of good administration – to skip an essential part of the process called impact assessment. It is just what it sounds like – a study on how the proposed directive will impact various stakeholders like hunters, reservists, sport shooters, recreational shooters, firearms collectors to name a few. Despite requests of the MEPs and rapporteurs, commission has failed – to this date – deliver a proper impact assessment to justify the directive proposal. I think we all know why. One of the reasons of the conference was to provide a voice to all shooting enthusiasts and an opportunity for each stakeholder group to voice their opinion on the directive. One could characterize it as a live version of the impact assessment. On 16 November 2016, FIREARMS UNITED had the pleasure of hosting the Firearms Directive Conference at the European Parliament in Brussels, chaired by your colleagues Bernd Kölmel (ECR), Jussi Halla-Aho (ECR), Dita Charanzova (ALDE) and Stefano Maullu (EPP), with more than 200 guests and journalists in attendance. At the Conference, which also featured Alain Alexis as a representative for the EC, it once again became clear, that the EC has not only failed to provide an Impact Assessment for its Firearms Directive proposal, but that the connection between legal firearms owners and crime / terrorism, alleged by the EC, simply DOES NOT EXIST – as pointed out by Stockholm School of Economics scholar Eric Lakomaa. 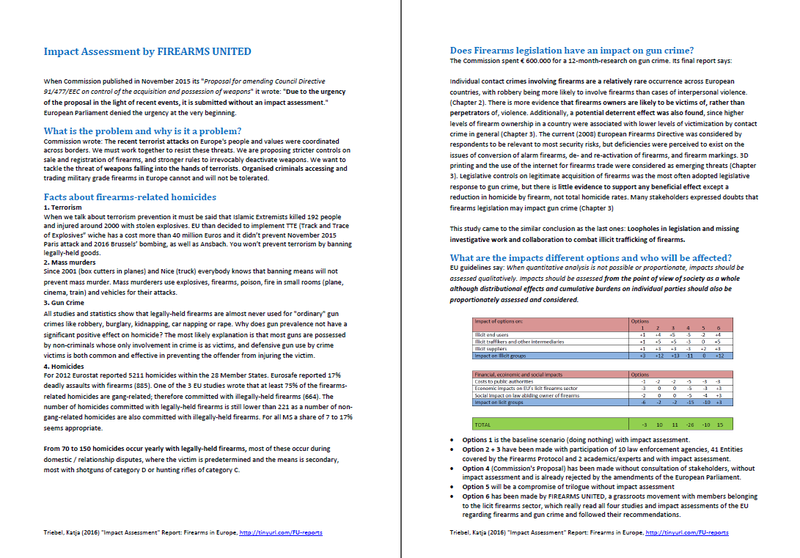 Given the recent Brexit vote, Trump’s victory in the US, as well as upcoming elections in Austria, France and Germany, as well as the Italian constitutional referendum – and the Swiss preparing to vote on leaving the Schengen area, should further restrictions on law-abiding firearms owners be imposed – we strongly feel that the EC’s proposal poses a very real threat to European unification, as millions of frustrated law-abiding citizens might turn to anti-EU parties in their country in response to them being unjustly criminalised. 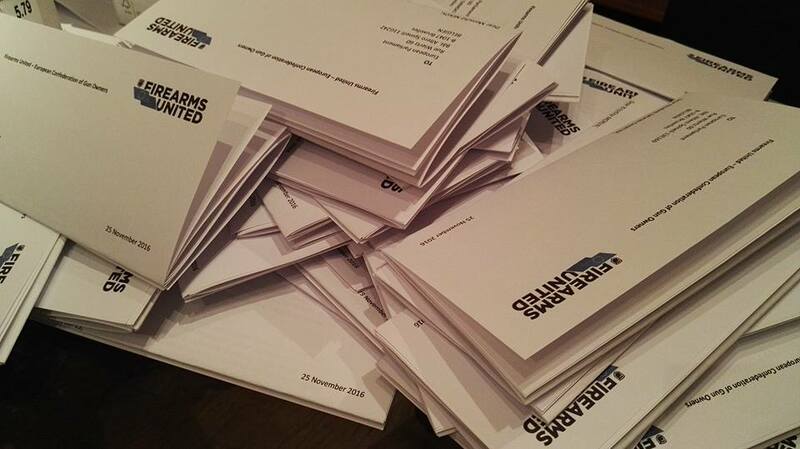 We have also enclosed the (shortened) Impact Assessment – produced by FIREARMS UNITED’s Head of Research Katja Triebel, following the EC’s failure to provide one – for your information. As is clearly visible from the IA, even “doing nothing” would achieve more than adopting the EC proposal on the Directive. Because nothing tells that you serious like using pony express instead of just sending an e-mail. 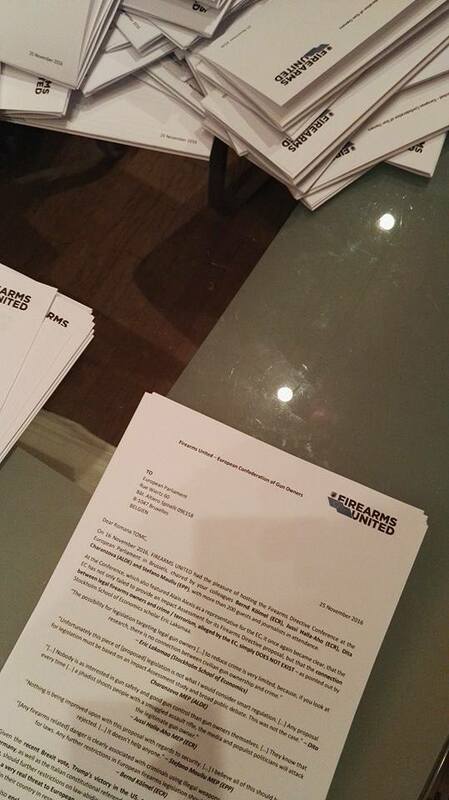 We just hope that the letters reach the MEPs in time before the next trilogue which is scheduled for 5th of December. Je pense que c’est la seule chose que l’on puisse faire ou adopter la solution suisse ,se désengager de cette commission !